By Zack Quaintance — The with great power comes great responsibility ethos of Amazing Spider-Man is almost universally relatable, especially for middle class Americans who’ve had even minor opportunities. It definitely resonated with me as a kid in a blue collar suburb of Chicago. The sum total of my power back then was manipulating my brothers into unholy pacts to combine birthday money for new video games. Yet there I was, reading ASM and nodding along, like, This story gets me. That deeper meaning, however, was only half of why I loved the comic. I was also there because Spider-Man’s jokes were funny. Last Wednesday, a new team of writer Nick Spencer and artist Ryan Ottley took over Amazing Spider-Man (we loved the first issue), and while a more holistic view of their run will ultimately determine whether they do justice to that ethos, it’s immediately clear the humor is on point. I, for one, chuckled while reading...chuckled! Anyway, today we're looking at five funny panels from Amazing Spider-Man #1. It’s not as insightful as some other recent Tuesday analysis pieces (ahem, see this thing about Deathstroke, please! ), but like Spider-Man, we are also here to bring some funny (plus we're at San Diego Comic Con next week, so we have to do five day's worth of posts this weekend). 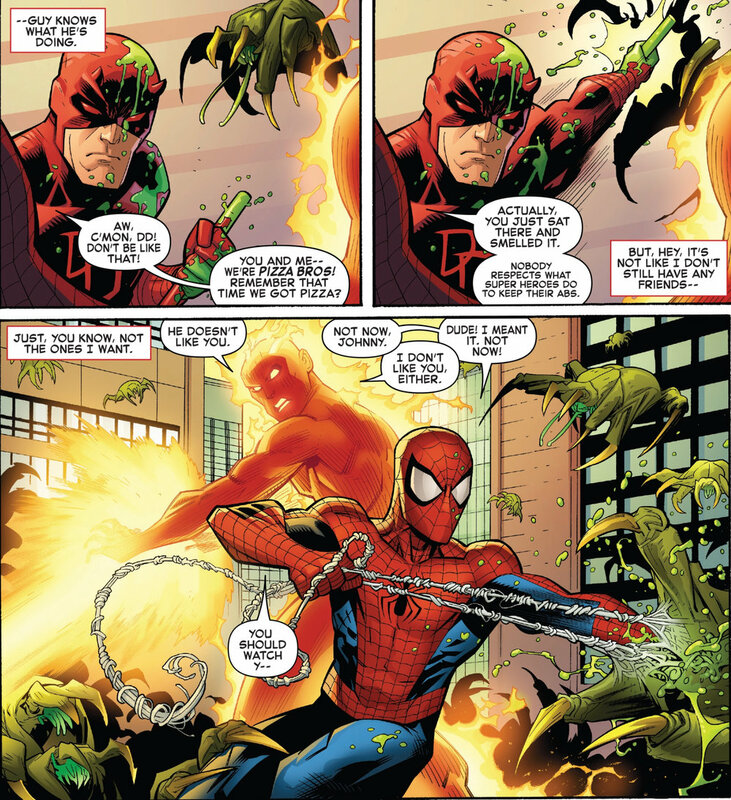 The previous Amazing Spider-Man writer, Dan Slott, had a good sense of humor, to be sure, but you try writing 10 years worth of quips for the same voice and see how your results are toward the end. What struck my as different about Spencer's humor right away was how it extends past Spider-Man to include jokes at the expense of or said by other heroes in the Marvel Universe. Take, for example, this excellent bit with the Guardians of the Galaxy. The writing here is funny, first as the Guardians banter and Groot lets slip something speciesist, and next as Hawkeye (a quippy fellow himself) mocks the way '80s music has become part of the Guardians' DNA via their depiction in the movies. In the (almost) words of the immortal Kent Brockman of The Simpsons, if Doom has said it before, he'll say it again...democracy simply doesn't work. Now, I'm not saying that Spidey should become Deadpool (oof, no thanks, one is enough), but it's nice when his books have a little pop culture perspective in them. There's this quote—and I can't remember its exact wording nor who said it—and its gist is that comics are sort of a fast and immediate reflection of the pop culture zeitgeist at any given time (ignore that the panel below quotes dialogue from a movie released in 1977, please!). Also, I for one have always been curious about how superheroes manage to find the time and nutritional obsessiveness to stay in such great shape. Nice to get a little nod to that here. This is absolutely the bit that made me chuckle. It should be noted that while I've placed these disembodied panels beside each other, this third panel is separated from the first one by quite a bit of narrative, making this joke what we who have listened to podcasts about the business like to refer to as a call back. Peter's chair (much later) finds a good home. This is the part of this feature wherein I take a step back to taper my excitement. I must admit, however, that it's pretty challenging here. Spencer and Ottley's Spider-Man isn't yet demonstrably superior (heh) to Slott's. It's been one (very very very good) issue for them, while Slott did his thing with varied level of success for almost 10 years. So, I guess I'll pump my enthusiastic brakes here a moment by noting that they need to show they can perform at this high a level for more than just one outing. Still, what a great start for the new team. It's a comic review cliche in an industry that runs on nostalgia, but this really is much closer to the Spider-Man stories I remember reading and watching when I was a kid.